I returned last night from a wonderful trip to Washington D.C. I want to begin to chronicle the journey in words, to go with all the amazing pictures I took, so I don’t forget. I will be breaking the trip up into several segments, because we did so much and saw so many things that it would never all fit into one post. After successfully making it to the airport, and sailing through security, we sat down to wait for our plane. The 2-lb brick of Tillamook cheese Gail asked me to carry in my backpack did cause the TSA guys some consternation, as did the large pack of ham lunch meat she was carrying. But, they x-rayed them, and confided that they had never seen anyone bring an entire 2-lb brick before:) Of course we were there the recommended 2 hours early, and thankfully, it didn’t take very long to get settled into the departure gate. We each had a backpack to carry onto the plane, and each checked one moderately sized suitcase, and one extra bag, full of gluten-free and Michaela-preferred food. I went off to take a little walk, and when I returned, I was surprised to see my sister, Gail, and the girls talking to someone. 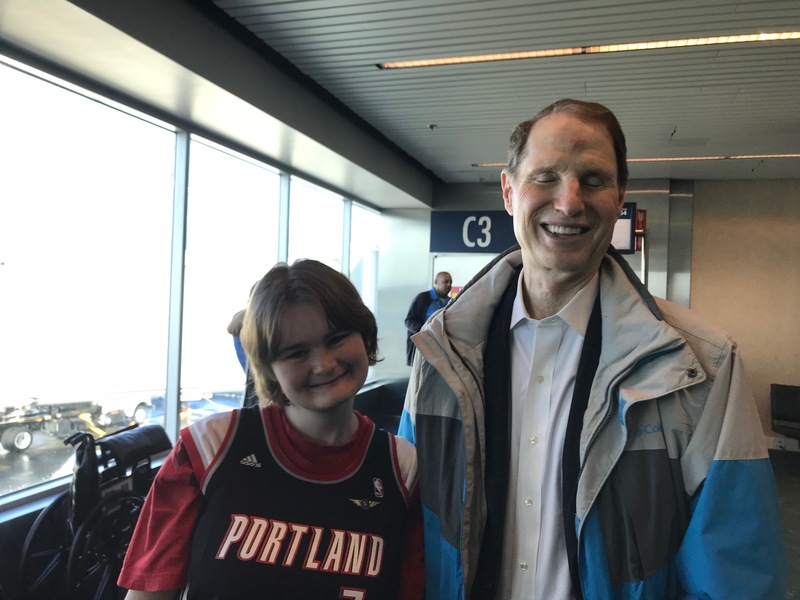 It was Congressman Ron Wyden. He was going to Washington, too, and was very gracious to answer questions, visit and pose for pictures. 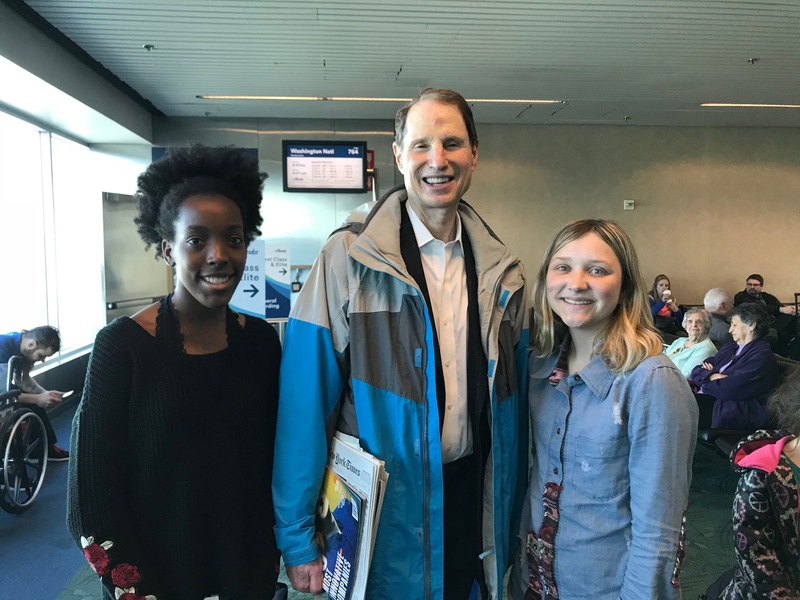 He rode on the same plane as we did, in the same regular class section, and I was pleased to see how friendly he was, answering multiple questions and visiting with several passengers as they travelled to and fro on the 4+ hour flight. When we arrived, our first task was to figure out the Metro. We did not rent a car, and used public transportation and Ubers the entire time. My sister and aunt had done research, so we knew which train to take to the townhouse my sister rented, we just needed to find it, and of course, drag our suitcases with us. After fumbling with the Metrocard machines, buying a pass for 1 week for low-peak hours, plus putting a little extra on for if we rode at peak times, we rode the escalator down, and were off on the yellow line, then changed to the blue line in mid-trip. Later, we would realize that although the yellow line was a short cut, we could have ridden on the blue one the entire way, saving ourselves a bit of suitcase dragging-through the crowd…..
We ordered in some food for dinner, and also ordered some groceries from Safeway. My niece, Alissa wanted to do it, so I told her about the promotion on my app for delivery of groceries–your first order was free delivery, plus $25 off when you ordered a certain amount. I think it was $75 or $100. So, she did ordered it with the help of her mom, and the next day food and drinks were delivered. When combined with the food in the suitcase, we were able to make out nicely for most dinners and breakfasts. The other kind of strange, kind of wonderful thing was the fact that there was a note that any food in the cupboards and fridge was for us to use, if desired. 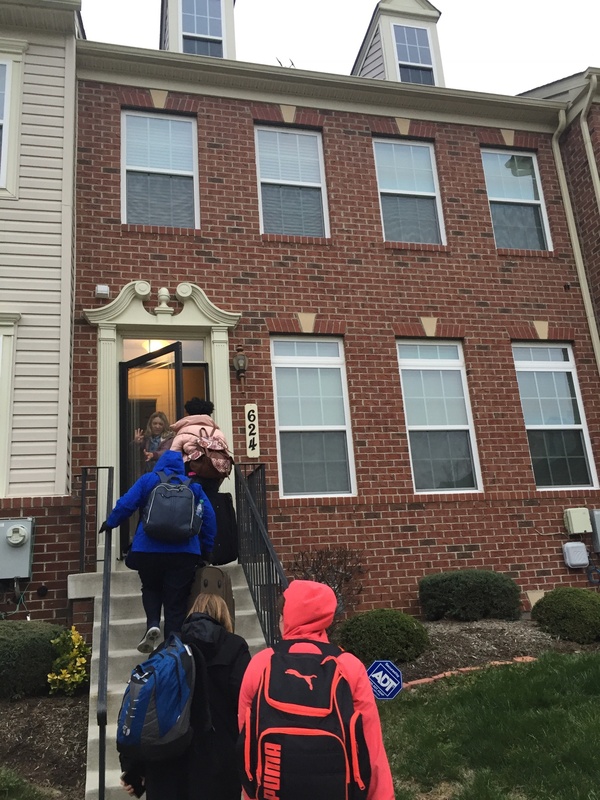 The house had been rented out right before we came to someone else, and the fridge contained lunchmeat, butter, cheese slices, milk, and much more, all still good. So, we ate a bunch of it. The next day, we got settled for a bit, and made a plan to head out to get familiar with the city and try to find out about the Hop-on, Hop-off busses. So, we headed to Union Station, where we were to buy the tickets. Of course, the girls thought it was hilarious that they had an area called the Kiss and Ride area at the metro station and had to goof around. Union Station was breathtaking, and we looked around the extensive shopping mall a bit. Michaela was so happy to see trains. 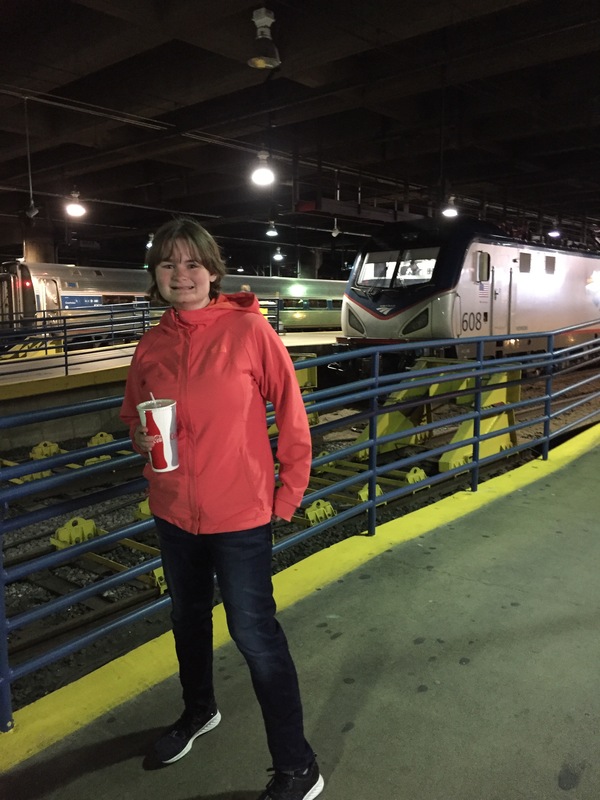 It’s a hub where various kinds of transportation comes together, so she posed by the Amtrak trains, brimming with happiness. The other girls were more interested in the stores, but we soon found the ticket booth for the desired busses and some food to eat. It would become a never-ending quest to find food and transportation, one that we conquered with not a little effort, but conquer it we did! Because it was afternoon, we were given tickets and allowed to ride that day, and the other 2 days we had purchased tickets for. So, we got right on! We wanted to ride the Red line for a while, and change over to the Blue line. We climbed up to the upper deck of the big red bus, plugged in our earphones and started admiring sights I had only seen on t.v., books and movies before. In a way, if felt very familiar, in others, very foreign. We rode past the Capitol, some of the Smithsonians, and were dropped off at the Washington Monument to wait for the Blue line bus. And wait we did! And wait, and wait, and wait. The cherry blossom festival was in full-force, and there were people everywhere. Traffic was so snarled that the busses could not get through. Thankfully, we had snacks and water in our bags, and the sun peeked out for a while. We quickly claimed a bench once we realized the bus was not coming any time soon, and sat down to wait. We enjoyed watching the teeming masses of people. Some were trying to ride bikes through the crowds, steering and wobbling through the people. Still others were trying to catch a bus, and spent their time running back and forth from our waiting area to the one on the other side of the street and down a little, hoping they would find one they could get on. The food carts were doing a brisk business, so people went past with dripping ice cream cones, and other street food in hand. There were people from every tribe and nation represented in that crowd–speaking countless languages along with English. Some were so young they were carried, or pushed in a stroller. Some were so old they were pushed in a wheelchair. Some were on Segways, but most were walking. What a fitting place to sit on my first day in Washington–under the Washington Monument, surrounded by cherry blossoms, and most important, surrounded by a huge crowd of people that make America what it is–the land of the free, and the home of the brave. As Michaela said…”Mom, this is a very patriotic place, isn’t it?” And, her mother’s reply? “Yes, Michaela. If Washington D. C. doesn’t make a person feel patriotic, I don’t suppose any place will.” I couldn’t agree more! Becky – I worked in Washington DC for 10 years and know what an amazingly awesome place it is. I was so happy to read that you and family were taking a trip there and axiously checked each day to see if you had started posts about your adventures. Can’t wait to read the rest of your trip posts. 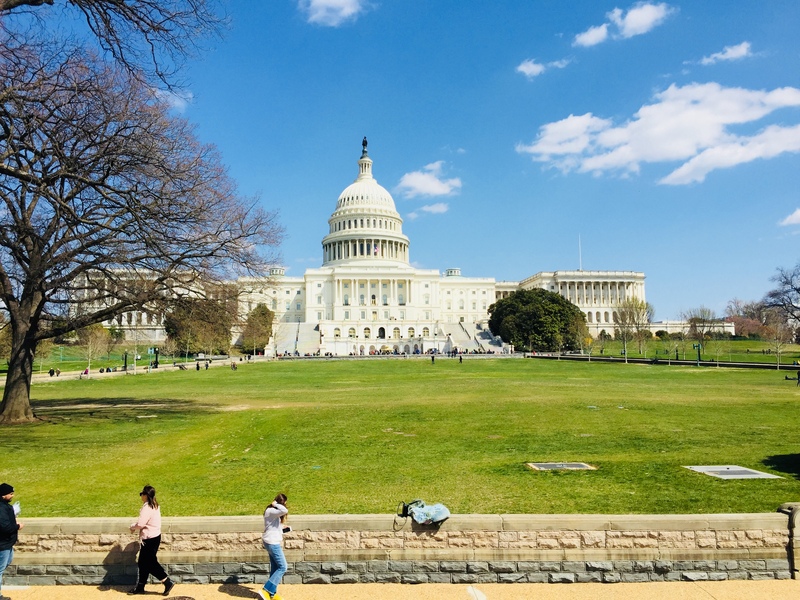 I agree with Michaela’s observation that Washington DC makes a person feel patriotic 🙂 There was definitely a special feeling I experienced each time I emerged above ground from the Metro – – even after 10 years I still felt it. DonnaMarie, I have to admit, I tried to post a time or two when I was there, but since I did not take my computer, it was so tedious on the Kindle, and the phone is just too small, and so I gave up after wiping out my efforts a couple of times with my fumbling fingers! Now, I’m eager to get it all down because it was a special trip and I don’t want to forget it. Where we live, there is some public transportation–a bus here, a bus and Max train in Portland, but they are not the same at all as that Wash. D.C. Metro! Those escalators go up so sharply–it’s like emerging from a deep hole, going up a ladder, and…..into the light—surrounded by all those majestic buildings. I wondered if anyone still felt the wonder after a time. I would like to think it would not grow old for me. We even had a conversation along those lines–wondering if people became jaded to it all, or not. I really enjoyed this post and will look forward to the rest of them. Sounds like you started off great. Can’t wait to read the rest of your trip. I was in Baltimore and DC for the past 2 weeks and although the weather could have been better, I still say Washington DC is a magnificent city. 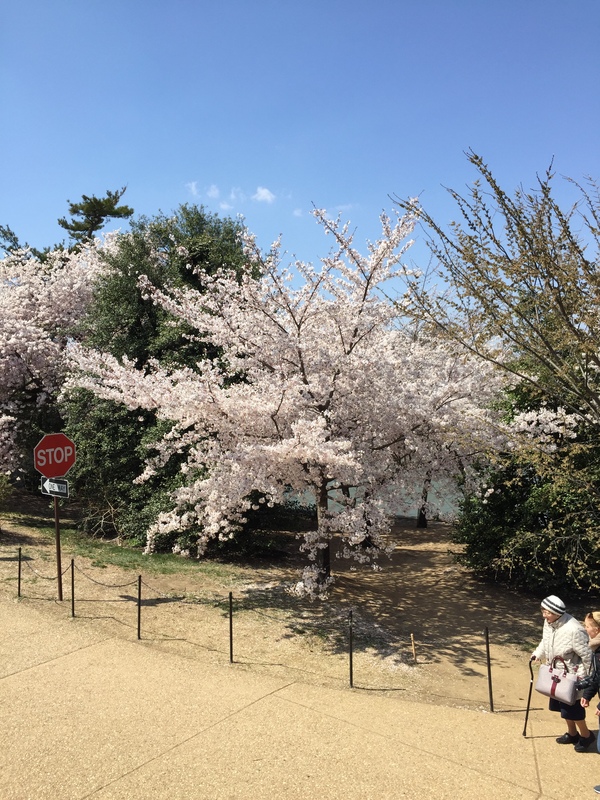 And those cherry blossoms…..don’t get me started on them…….unbelievably beautiful! Yes it was crazy but since I’ve been back in the Chicago area it’s been hanging around freezing. Yuck! I’ll take 84F anyday. I am excited to follow along on your trip! 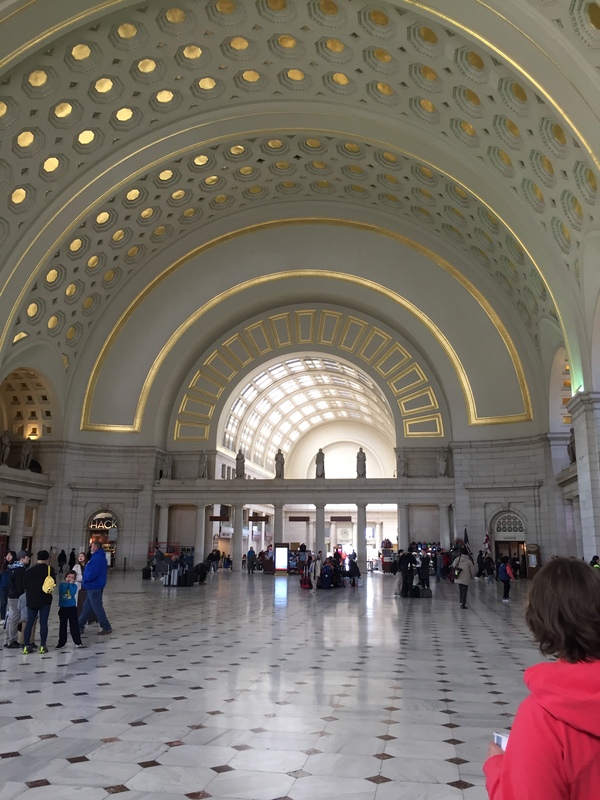 My family changed Amtrak trains at Union Station about 40 year ago and it did not look like that! It was dark and depressing and scary. I am glad to see it as it is now. The Kiss and Ride pic is priceless! I love the cherry blossoms. Glad you got there safely. Love that you brought your own cheese. What an adventure. DC is one of my favorite places to visit. I loved all the museums and sites. One time we got left by the tourist bus we took to see all the war memorials. Can’t wait to hear the rest of the stories. Thank goodness we were never left behind. That must have been a little disconcerting for you! Sounds like you had a lovely trip and a bit of an adventure right from the start! I have never been to Washington DC, so I am glad you will be sharing your experiences with us. Looking forward to reading all your posts! Thank you. Although my sister and aunt had both been there before, it was my first time, and the girls’ first time, too. It was a wonderful experience. Thank you. I’m glad you are enjoying them.